No matter what the setting, the good looks and durability of hardwood floors can be maintained with minimal effort. It’s simply a matter of proper care and maintenance. All hardwood floors should be cleaned regularly to remove dirt and grit from between the floor boards. 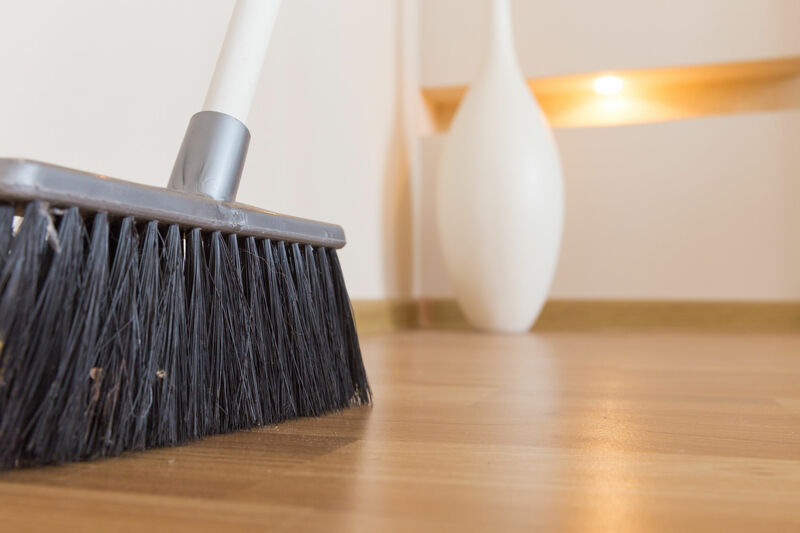 Avoid using a wet mop which can dull the finish, instead, sweep with either a dust mop or broom that features exploded tips or vacuum the floors using a vacuum with special hardwood floor attachments or one with the beater bar turned off. Wipe any spills immediately, using a soft, dry or slightly damp cloth, starting at the edges of the spill and working toward the center. Allowing spills to remain on hardwood floors could damage the finish, as well as the wood. Avoid walking on hardwood floors with sports cleats or high heel shoes.These can scratch the finish, or even dent the floor. Placing felt pads on the bottom of furniture legs will minimize scratches. Further minimize scratches by placing scatter rugs at all entrances to help keep small stones and debris out. Be careful with your choice of rugs, scatter rugs with rubber backs can discolor wood floors. Special rug mats can be purchased from a wood flooring retailer that will protect the floors from discoloration. 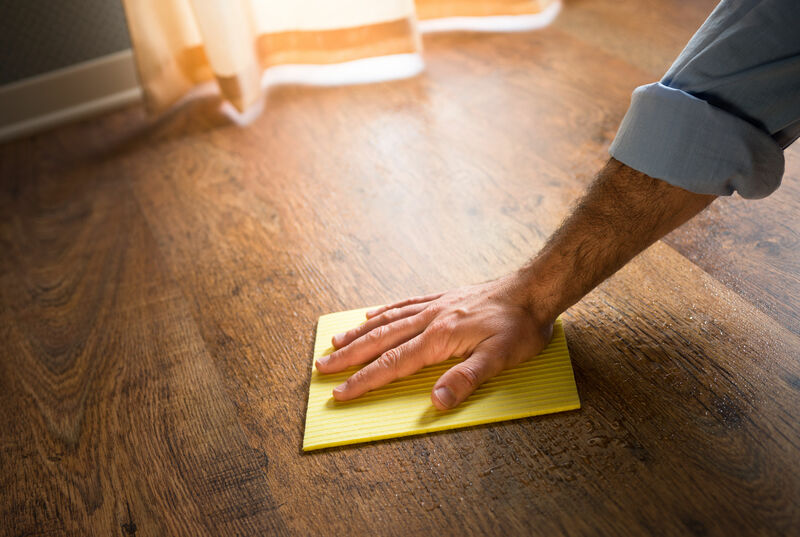 You Should never use Wax, Soap, or Furniture Polishes, on Hardwood Flooring. There are two types of finishes that are most often found on hardwood flooring today. The most common are Polyurethanes, and Aluminum Oxide Polyurethanes. Care for these modern finishes is very easy. Simply sweep, or vacuum, to remove dust. Dampen, but do not soak, using any type of mop. Cleaners that do not have soap, or oils,or need rinsing may be used. Then dry vigorously. Big towels work well. The other type of finish that has recently gained great popularity is Penetrating Oil. The Maintenance for the Oil finish, is a little different. Of course you can remove the dust in the same way, sweeping, or vacuuming. You Should always be aware of furniture that may be damaging your floor. There are many great products readily available for the legs, or feet of furniture. It is much better when problem furnishings, are identified quickly. Knowing which type of finish applied to protect the hardwood floor is important. Different flooring finished require different kinds of care; contact your flooring professional to determine the care for the particular finish used on your floor. Using the right maintenance product for your floor will protect and prolong the life of your floor. Surface finishes, also referred to as urethanes and polyurethanes, are practical and very popular. They remain on the surface of the wood and form a protective coating that is water-resistant, durable and requires minimal maintenance. For cleaning purposes use products recommended by the flooring manufacturer. If the floors were finished or refinished on site ask the installer which cleaning products they recommend. Never use wax-based or petroleum-based products on a surface finish floor, they will damage the finish. Wax finishes soak into the wood, harden to form a protective penetrating seal, and when needed, are maintained with additional thin applications of wax. Only solvent-based waxes, buffering pastes or cleaning liquids made specifically for wax-finished wood floors should be used. Use cleaning products made specifically for wax finishes. Follow the directions carefully to determine how long the cleaner should remain on the floor. One the floor is clean, apply a new coat of wax to restore luster. Acrylic impregnated finishes are injected into the wood to create a super-hard extremely durable floor. These finishes most often are used in high traffic areas of malls, restaurants and other commercial settings. Cleaning an acrylic impregnated floor depends on the finish. If the floor has a urethane-based finish, follow the same procedures suggested for surface finished foors. If the floor has a nonurethane-based finish, use a spray and buff system, as recommended by the manufacturer. DON’T HESITATE TO INVESTIGATE!! | IT PAYS TO BE KNOWLEDGABLE!! Proper care and maintenance will protect and prolong the performance of hardwood flooring for a lifetime, and even longer.